Metal roofers, especially those from Cooper Roofing Vancouver, need to perform a perfect install job each time. After all, it always rains in Vancouver. That’s why it’s mandatory to bring an umbrella with you each time you leave the house. Even in summer when the sun is out, you just never know when dark clouds could form to get you soaked in the rain. Spring, of course, is even tastier. It’s the best season of the year to get our metal roofing company tried and tested. Luckily, it has never been so good. For many years, we have been serving residents from the central city all the way to the West and Northern Vancouver areas. Cooper have built trust and advantage for many years because when they install it, they make sure that they do an excellent job each time. Cooper Roofing just knows what’s at stake when metal roofs are installed in a sub-standard fashion. So if you happen to be in the business or work as one of Cooper Roofing’s metal roofers, a lot of responsibility falls into your hands and your feet, of course. It may be challenging to either fix or install it on a hot day in Vancouver. However, there are times when this kind of scenario just can’t be avoided. You can end up feeling like a cat on a hot tin roof, but with proper equipment and knowing what the job entails–you can be still in the best form to do the job. Of course, if you’ve been installing them for a long time, you’re highly likely to possess the agility of a cat to navigate those narrow passages and scary heights. After all, we’ve been in the business for quite a long time. And bear in mind, every job we do comes with a 55-year guarantee. For other providers, this is one tough act to follow, but as far as we’re concerned–quality is a way of life. Like a chain that can’t be broken, Cooper Roofing has the next edge over the competition. We’ve become synonymous with the zinc roof, which is known to absorb only 20% of the sunlight. This keeps it fresh during the summer. And with the Cooper Roofing service guarantee, customers expect a lot from metal roofers from the company. Metal roofers are expected to be able to mount another roof to an existing one with agility. Also, homeowners hooting for us expect the best especially when it comes to fire protection from top to bottom. And with all the experience that the company has amassed over the decades, Cooper Roofing can install metal roofs of varying complexity. That’s why they’re never created equal. Those from Cooper Roofing are merely expected to be the best of the best. Thus, these elite contractors are not only expected to have a lot of experience. They are by far the best-trained professionals in the industry. So for newbie contractors wishing to work for us in the future, be advised that the bar is set–and it is high just like a roof. Certification, as well as standards, are expectedly stiff for our designers, installers and metal roofing contractors alike. Hence a word of caution to all the aspiring companies out there: You need to be the best to qualify for the top jobs here. Working for the established leader in the roofing business is no doubt a tough job. But at the end of the day, the level of job satisfaction you will get is undoubtedly up to the roof. You could be singing in the rain as you leave the job site, knowing that you’ve done an install that is second to none. With the 55-year guarantee, it’s rather evident that Cooper Roofing isn’t in the business for a quick buck. Instead, we were always looking for a long-term partnership with businesses and homeowners alike. That’s why as far as standards go, work inspection is paramount, along with completing projects with precision and on a timely basis. The customer must be happy as all requirements are met. At the same time, building standards and Cooper Roofing expectations must be met without compromise. Professionals are also expected to use only the highest grade. And as far as finishing touches go, the finished product must look like a work of art. That’s why our metal roofing company offers the most comprehensive palette of colors to choose from. While the average must be able to withstand all the elements, the material it is made of should be light and sleek enough for agility’s sake. Such versatility ensures that customer satisfaction is at its highest levels. From work itself down to the customer service level, we have all the bases covered as far as metal roofing is concerned. There’s always a knowledgeable staff available to answer any query over the phone. Plus, by continually using only materials of the highest quality, moss, mildew and fungus-resistant materials are assured. When it comes to installing metal roofing shingles, We adhere to the most stringent standards in Vancouver and anywhere else in Canada. Thus, the company’s employees treat shingles like an art form with each row gracefully overlapping the one below. We’re also a leader in the installation of copper roofing. Apart from the neat and shiny appearance, the material used ensures they can last for a century. Additionally, copper acts as a protective shield atop the house–thereby taking care of your investment like a precious sculpture. For extra aging or that “aged green appearance sought after among hotel and office establishments, copper metal roofs make an excellent alternative.” as stated by Delta T Control. What more, there’s no need to paint metal roofs green or emerald for this purpose. The natural oxidation of copper roofs makes the greenish hue possible at no added cost to you, the building owner. For best results, plan your choice with an agent. The company’s representative can indeed provide you with invaluable advice on what’s in and what’s out. There are many different possibilities as far metal roofing is concerned. 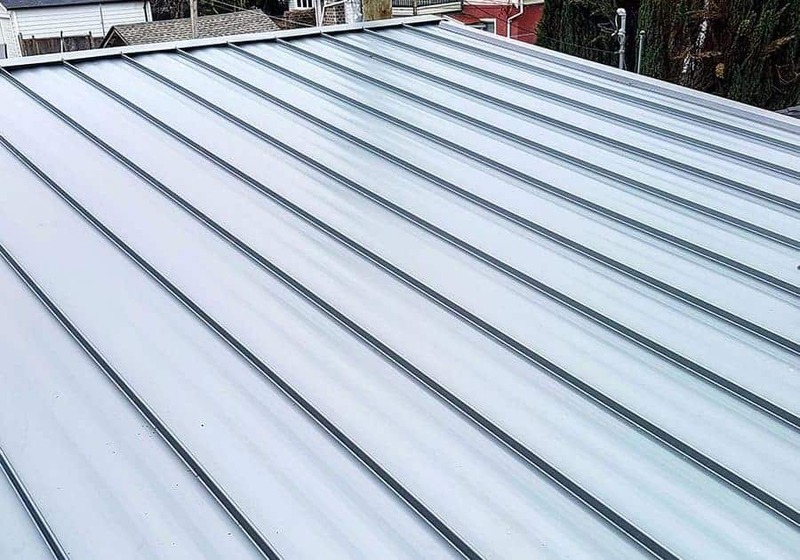 Consultation keeps you ahead of the game, ensuring that you will never have to remodel your metal roofing or anywhere else every ten years or so. The more time you give the agents to handle your requirements, the better the outcome of your work. As the crowning glory of your property, nothing must be left to chance when it comes to design and installation. You’ll be surprised to find an infinite number of design specifications for the roof that you have in mind. At the same time, you can also benefit from years of experience of Cooper Roofing. Metal roofing experts can save you the trouble or avoid the pitfalls of a dated roof. By heeding their advice, you can save yourself thousands of dollars just by being able to skip needless remodeling it every decade or so. In Vancouver just as in any other Canadian city served by our company, there are many different building specifications required by city councils. Only our agents can provide you with the last word in design specifications. Backed by more than half a century of successful installations and service combination, your partnership with Cooper Roofing is a real win-win scenario. These days, trust is a beautiful thing. But that’s only if the expert has the track record to have the job done without incident. As the top part of your house or office building, leaving it to be capable or expert hands can spell the difference between make or break. Doing so will leave you to worry-free for the next 55 years. Just imagine the peace of mind and the savings involved. Surely, no other metal roofers can offer or match the same deal. ).